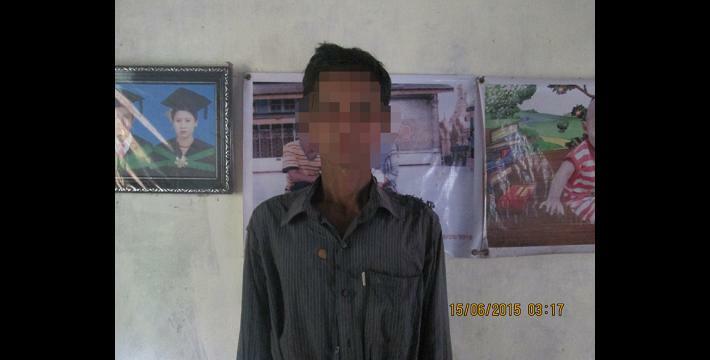 This Interview with Ma N--- describes arbitrary arrest and torture occurring in Thaton Township, Thaton District, during the period between June and July 2013. She described how her husband was arbitrarily arrested and tortured by the Myanmar police in June 2013. Her husband finally said that he was involved in a bus robbery, although he asserts that was not involved. 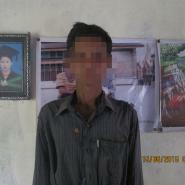 He confessed to the crime after torture by the Myanmar police. The robbery that Myanmar police suspected Ma N---‘s husband was suspected of was the Yar Zar Min bus robbery that happened in Mon State, Thaton Township, Thaton District on June 8th 2013 when a bus was intercepted by robbers whilst heading from Kyaik Kha Mi to Yangon. The following Interview was conducted by a community member trained by KHRG to monitor local human rights conditions. It was conducted in Thaton District on July 26th 2015 and is presented below translated exactly as it was received, save for minor edits for clarity and security. This interview was received along with other information from Thaton District, including two other interviews, one photo note, one situation update, 238 photographs and 1 other document. It is called B--- village. It is called C--- in Burmese. I heard that it is called Sa Kan Gyi village tract. 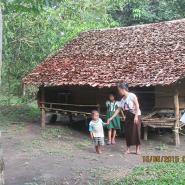 It is in Sa Kan Gyi village tract. What do you do [for your livelihood]? I do day labour and farming. You work for your own farm or other peoples’ farm? I work for other peoples’ farms. Anything else [that you do]? I do day labour around here. How [many] family members do you have? The eldest is 19 years old. How about the youngest one [age]? Now I have asked you about your work and family so now I am going to ask you about your husband. What is the name of your husband? He is called Saw D---. Does he have another name? No, that is the only name that he has. Now I am going to ask you about your husband who is being detained [by government police officers] now. How does it [Yar Zar Min robbery case] relate to your husband? He was forcibly arrested actually. Firstly, they said he is a suspect and later on they accused that he was in the robbery case. Saw D--- was arrested two times for the case. Yes, police. When police arrested him, he was in the field pulling out rice seedlings on the western side. He was taken for two nights and he was released after they questioned him. He came back and stayed [at home] for over a month and they [police officers] came and arrested him again and he has been gone since then. Can you remember the date that he was arrested? It was on July 22nd . The first time was on 11th of June . He was arrested and detained for two days and then he was released. When he first got arrested, what did they say about the case? They said, “You robbed and you are related to the case”. And he replied, “I do not know, I was not in it”. And then they released him. He got punched two or three times and his watch was cracked. He came and stayed for over a month and he was gone since he got arrested the second time. Were they all police who arrested him? How did they know it [was him] and [to] come and arrest him? They did not know [it was] him firstly. They arrested Saw E--- first and then he [Saw D---] was arrested later. He was taken for two days [at] first and he stayed [home] for over a month and he was taken again. He has gone since then. On the second time that he was arrested, he was beaten, punched, [and they] hit him [against something], withheld water and food from him for three days, [and] they hung him up by his neck when they questioned him. [When they interrogated him] they made him kneel on a wooden plank full of two inch iron nails. He has injuries on his leg [and] the scar remains [on his knee]. When was the second time that he was arrested? It was on July 22nd. Was it the second time? In 2013? Yes, it was on Saturday. When they came to arrest him, did they inform the village head? They did not inform the village head and the village head did not know about it. They arrested him in the field; I did not know either. Did they bring him to the police station immediately after they arrested him? Yes, to the police station. They did not tell you about it? They came at 4:00am with a torch light and my children cried. They did not allow my children to cry. We slept in the mosquito net and they came and ripped off the mosquito net and pointed at my head with a gun. I did not know anything and was so scared. Yes, they were. The chief police officer also was there. They came and questioned you and then arrested your husband? [They arrested him] at 1:00 pm. They came and arrested [him] at the farm? You said he was detained for two days. Do you know what happened to him during the two days? They hit him and beat him. They asked him, “Where did you keep the gun?” He replied, “I do not have a gun”. Then, they tortured him and made him say that he had the gun somewhere. He [Saw D---] said it was so painful and they were torturing him until he confessed. He [Saw D---] then finally said, “I hid the gun at the cemetery”. And they went to find it but they could not find the gun. How could they find [the gun]? There was nothing. [He said it because] he could not suffer the pain. He was so thirsty that he drank toilet water and they knew it and hit him and all the water came out. Did they inform you before they arrested him the second time? No, they did not inform me. How about the village head? No, they did not inform the village head either. Was the date like you said before? They did not release him since the second time? Did they allow you to see your husband after the second time they arrested [him]? No, they did not allow me to meet him [in the prison]. They allowed me to meet him only when [he] was at the police station. So since then you did not meet him anymore? Later on, because the case was handed to the court, I was able to meet him with a lawyer. Is there any different information that you heard from others? No, I have heard nothing special. Do you think your husband would do that [commit the robbery]? So imagine the situation of the time when your husband [was] with you and the situation now, were they [the situations] different? Not different. We work for daily wages. What is the difference when your husband was here with you? How was your livelihood? When he was here he worked and it was not bad and now he is not [here] and I have to face problems with my children. I have to borrow money and my siblings also cannot provide me with food every time [as they are also poor]. It is too hot and I have children and I also have to follow the case and have to go for the court appointment as well. Sometimes when I come back [from the court appointments] my children have to eat the rice that has started to go off. They set an appointment twice or four times a month. I have to go always and it cost money [for travelling]. Do you [know] where your husband is now? He is in Yangon in Insein prison. Regarding your husband Saw D---s case, do you think your husband would have [done] that kind of behavior? After your husband was gone, did your children miss their father? Did they talk about their father? Yes, they did. If you can help us, help us. Where does your oldest child study? What standard is he in? He is [in] second standard. The oldest one? He is 19 years old and only second standard? He studied up to second standard and he had to look after the cows and he did not have time to go school. He quit school when he was young and looked after the cows [instead]. Is there anything that you want to say related to the Yar Zar Min robbery case that you think [is] important? If they [any organisation or lawyer] can help us, help us. We are facing problems [now]. How about other things like that the police are not doing [their jobs] fairly, etc? If I have to express [my feelings about this], I do not feel good about it and I am not happy with it. He was arrested by the police; do you think there is anyone who reported to the police that your husband was in the case? For him, he does not have that [kind of behaviour]. I do not know for other villagers’ side. How about his situation [behaviour] with other villagers, friends and his siblings? He lives and works fairly. He works as a day labourer with his siblings and friends. Thank you very much for answering my questions. And now I finally would like to hear your words regarding your family or your husband or for yourself. Do you have anything to add regarding to these things? Now I am in trouble for my family livelihood, so if people can help me please do help me. I heard that the police will come and build the house for you. Is it true? They [Burma/Myanmar police] tortured Saw D--- and said “Say that you robbed, I will build for you a house if you say that you robbed”. And he replied, “I do not want a home and I did not rob. I am good with my current situation; I do not want a nice house”. And then they said, “Say it. If you say [it], I will use you as government’s evidence”. And he replied, “I do not want to be [the] government’s evidence. If you want to kill me, kill me. I do not want any of you to go and build me a house”. After Saw D--- said that, what did the police do after that? Police did not tell him anything. Later on, they had to transfer the case to the court. They transferred the case to the court after they had detained him for 15 days. Did the police tell you that they will build the house for you? They did not tell me anything about it. I heard that the government or a group supported the victims’ family with 100,000 kyat [US $73.39] for each [victim]. Is it true? 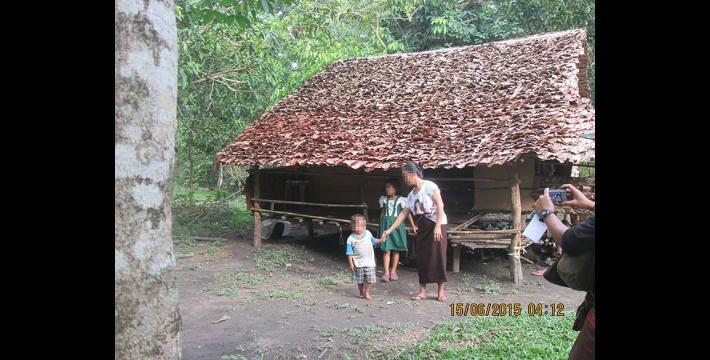 There is a group that supported us with 100,000 kyat [US $73.39] for each [victim] recently. I do not know where they are from. They said it is for us to eat [to help with our livelihood]. They said it is for our children and that they feel pity for our children. Who came and gave the money? Did they not tell you their organisation or where they work? I do not know because I did not ask. Who came and gave [it] to you? U Htun Win came and gave [it]. He came with the Township Chief of Police Officer. From the Burma/Myanmar government’s side? Did he not tell anything? He just said [he is] coming to help you [with money]? What did they say then? They did not say anything. I did not want to take it but they forcibly gave [it to] me and I took [the money]. So you tried to refuse [the money] before you accepted it? Yes, I tried to refuse. You had no choice and took it finally because of your livelihood problems? You do not know where the money came from? So we got all information we want and we would like to thank you finally for answering the questions related to your husband being accused [by the Burma/Myanmar government police] and the whole story about it. The Yar Zin Min robbery case made headlines in Burma/Myanmar in 2013 when a public bus was intercepted whilst travelling from Kyaik Kha Mi to Yangon and robbed. The bus driver was shot dead and a reported 4,887,000 kyat [US $3623.12] as well as passengers’ gold was taken. No official evidence has been reported to have found by the Myanmar police following the robbery. See “Villagers claim five men sentenced to death are scapegoats,” Karen News, April 2015. Insein prison in Yangon is renowned for overcrowding and poor treatment of its detainees. See “After release I had to restart my life from the beginning,” Assistance Association for Political Prisoners (AAPP), May 2016. All conversion estimates for the kyat in this report are based on the 16th January 2016 official market rate of 1362 kyat to US $1.